Over the years, we have become accustomed to a rising standard of living. 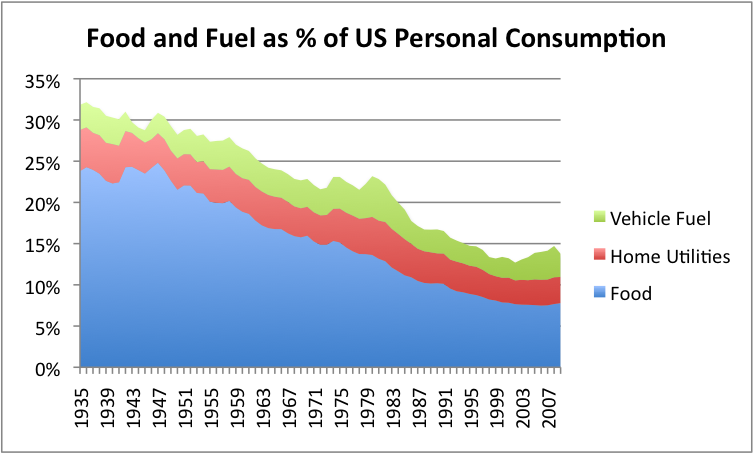 One of things that has helped this happen is a gradually declining ratio of food costs to total personal expenditures. Energy costs have not followed as clear a trend, but are higher again now, and seem likely to be higher in the future as well. As long as the sum of food and energy costs were declining, an increasingly larger percentage left over after covering “the basics” could be used for other purchases. This no doubt contributed to a rising standard of living, because a larger share of income could be used for education, and for recreation, and for new homes. The greater share of income that was available to spend on new homes no doubt contributed to the long-term rise in home prices. 1. Plan as if one of the big issues in the years ahead is likely to be job loss in the conventional oil-dependent market. 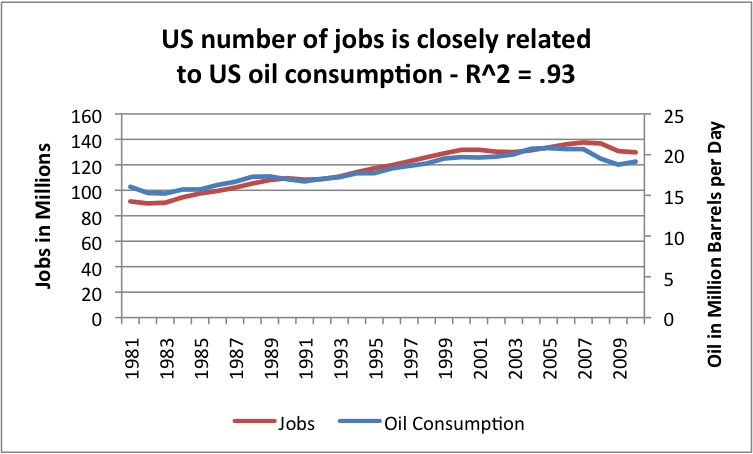 I have shown previously that the number of jobs held by workers tends to follow oil consumption closely. This is not unexpected, given the way today’s economy is constructed: If a worker produces goods or services, this process often uses oil. Furthermore, if the worker has a salary from his job, he/she can afford to buy goods produced with oil. If the job moves to, say, China, the energy use for the job moves over there, and the Chinese employee, (rather than the US employee), will have the income to buy goods and services made with oil. If the Chinese employee’s salary is lower, he/she will be able to buy less goods produced with oil than the American employee, but will still raise the total amount of oil consumed in China. 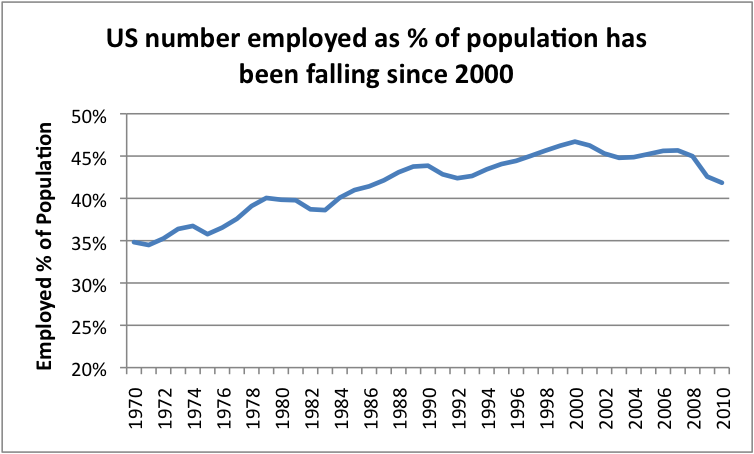 It seems to me as though what we should expect is another step down in the percentage of the population that is employed, probably led this time by a reduction in government employees and in jobs funded by “stimulus” programs, as governments find that tax revenue is not sufficient to pay for everything. Note that in Figure 1, a rise is the ratio of food and energy consumption to total personal income can come in two ways: (1) Food and energy costs rising and/or (2) Fewer people employed, and those who are employed working fewer hours or for less pay. It seems to me that we are likely to see a combination of these effects, and it may be that (2) is the bigger issue. A traditional response to job loss is to move together into large family or friendship groupings. Then those who have formal jobs can help support those without jobs. Very often, people to start providing more services for each other outside the formal economy, including raising a garden, caring for each other’s children, caring for elderly parents, and making crafts for sale. I should note that the employment count used in my calculations are for “non-farm employees.” Years ago, if people raised their own food on a farm (even if they traded it with others), no one counted their employment. If more people start raising their own food outside of the traditional system, this would seem to be more or less a reverse of what happened in the past. 2. Stay as flexible as possible, since we don’t know how things will turn out. If you are able to move quickly as conditions change, this flexibility has its advantages. Losing your job is probably the biggest risk right now. Think about how you might deal with the situation. Also, we don’t know how things will change in the future. One area may be affected by a lack of water; another by an electrical system that no longer works, and can’t be repaired in any reasonable time frame, perhaps after a storm. If you are not too tied to where you are, you can make better decisions regarding changes. Of course, flexibility comes with its downsides. In many ways, it may be better to stick with family and friends that you know, in order to have a suitable support system. 3. Take advantage of what you can do now; things may not be as good in the future. While we don’t know about the future, we do know about today. If there are things you have wanted to do, now would be a good time to do them, while you still can. I visited China. There are shorter trips, and easier-to-do things possible as well. You can study a language, or visit family. 4. Find ways to be happy, even without material wealth. Learn to enjoy nature, and the company of family and friends. Join a church or a club of others with similar interests. Start doing things to help other people. Learn to sing, or to play a musical instrument. It is not good to focus on all the bad things that might happen. All of our worrying is not going to change anything, so we might as well make the best of a less than ideal situation, and do things we can do, even with very limited resources. 5. Plant a garden, if that is convenient for you. Ideally, you will want to have a garden that can be maintained with little outside inputs other than those provided by nature. If water from your roof can be used for watering, that can be helpful. But don’t assume that you can drive to the store for all the amendments and sprays you have been used to in the past, even if they are “organic.” If you can learn seed saving, that is good too. 6. Consider buying a home with some land, where you can have a garden. Obviously, such a choice is not for everyone, since for one thing, many people cannot afford this option, and for another, buying such land may make commuting to work difficult and expensive. Also, having a large garden is likely to require a considerable time commitment and will require learning many new skills. However, for some this may give peace of mind, and way to feel that they are making the situation better. 7. Don’t count on paper investments to do well. We keep being told by investment planners that if you do this or that, and you will have plenty of funds for retirements. If there are fewer goods and services produced in total as energy resources decline (perhaps not starting immediately, but at some point in the future), then it is pretty likely that most of us will find our share of what is available is smaller than what investment planners have led us to believe. For example, pension plans are not likely to be able to pay out as planned, Social Security and Medicare will need to be cut back (or replaced with something that pays less), bonds are likely to have high default rates, stocks are likely to decline in value (at least relative to the things you need to buy), and bank deposits may prove unreliable. You will probably need to expect to work longer, and to rely more on family and friends. Keep up good relations with your children. As times get worse, consider encouraging one or more to move back in with you, or offer to pay to move in one of them. It is easy to get depressed when thinking about the future, but this is not really helpful. It is probably best if we can find ways to be happy now, even if it means ignoring the subject of what may happen in the future altogether. So don’t be too hard on family and friends who “deny” that the situation is likely to go downhill. Denial is a coping mechanism for many people. If we want to see what may happen in the future, there are a number of countries around the world that seem to be leading the way. Right now, following what happens in Greece and Spain may give an idea what other debtor countries may be facing. With respect to oil countries that are producing less and less oil, Mexico, Egypt, and Yemen are models. Seeing what happens in these countries may give us an idea of where world economies are headed. This entry was posted in Financial Implications, Planning for the Future and tagged employment, Food prices, oil prices. Bookmark the permalink. I think just that one day will be very hard. And then a 2nd experiment where it is not just about food – but nothing which is not produced on the own land, garden, in the house – can be used. No soaps, no use of toothbrushes, allergy pills, no commercial dog food for the dogs, nothing from the freezer, nothing from the fridge, no car and only very limited electrical power….you get the idea. (I am a bit scared about the outcome)….. In the 40s, my dad and I often canoed into one of the most remote parts of Canada and partially lived off the land for a week or two. I understand why our ancestors seldom lived beyond 40 years of age. Lots of fun when you are young and healthy and it’s mid-summer. I admire your experiment – perhaps you could get some members of congress to join you. I think your idea is a good one. Schools should be teaching our children things like this as well. There is so much we take for granted. 1) First of all, the number one obstacle to people going somewhere and buying some land with a house (not vice versa) is they can’t sell the one they have. It’s not the job that is the obstacle. HOUSES ARE NOT SELLING. This is monumentally huge and not understood by anyone who hasn’t tried to sell. The bottom line really is . . . you’re not going anywhere and you’re also not going to survive in place. For most, the odds are poor. 2) Water is first. Not second. Gardens are not important. A garden is just an invitation to passersby to chow down after dark. Water is all important. Sewage is all important. When the Upheaval arrives, the guys who get paid to keep water in your pipes aren’t going to be going to work. Period. A septic tank is going to fill up. Have a way to pump it out (without power) and deposit the result somewhere on a wheeled cart. Forget sewers. The guys who keep them running aren’t going to work, either. Sewage is an enormous problem, especially when the rivers will be choked with bodies tossed there by people without caloric energy to dig graves. The same effect renders water supplies undrinkable if they come from above ground and are not in mountains. 3) Tetanus. Tetanus. Tetanus. A world of white collar workers are going to be spending all their time doing manual labor and they will be unskilled at it and will cut themselves again and again. There are now non refrigerated tetanus vaccines available. 4) Solar power is a loser. The cells deteriorate over time and they are only about 13% efficient off the Solar Constant to begin with. If you are near mountains, find a stream and have a plan for micro hydro. Far superior to solar. 5) Ether can be synthesized. Many antibiotics are now provided in powdered form for mixture with saline before IV. The point being, no refrigeration required. Have a plan to loot all the bleach from surrounding convenience stores after the hordes strip the food shelves clean. Bleach won’t be recognized as important. It is. 6) Manual air pumps. Tires on carts will go flat and collecting wood without a cart is not possible for substantial quantities. Have spare tires, too. 7) Keep your mouth shut pre Upheaval. The hordes WILL be coming, and you may even know them by name.. Don’t force yourself to shoot people by telling anyone your plans.